These were purchased directly from the Miners (Garimpeiros) back in the 1980's when we were visiting our Brasilian office. We got a great deal from the miners and we marked them at a great price at that time. These were priced back in the 80's and the prices haven't been changed. 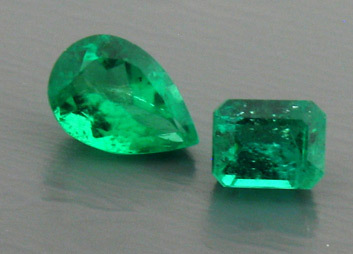 These are quiet clean for emeralds. Many that are out there on the market are opaque and can look like green plastic! 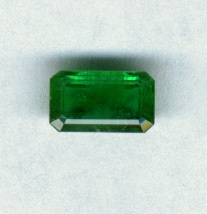 In our emeralds, one can usually see some Jardins at times within some pieces, but this is to be expected of Emeralds. These Emeralds are certainly a steal and very much underpriced now! One of the reasons that you have not really seen emeralds on our website previously is that the bright green caused by Chromium within the Emerald cannot be captured properly with a camera. These gems should be seen in person because the green glows. A few pieces are on the darker side, but the color is still quite evident and nice! 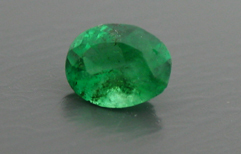 We have been hesitant to put photos of our gemstones on line if we cannot create a decent photo. Rhodolite is another gemstone that we cannot capture the beauty and true color on film. A - 0.40ct $880 Photographed in book - see other photo on this page. 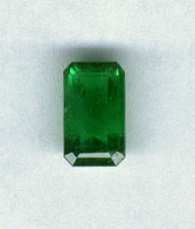 A - 0.46ct Pear Shaped Emerald 6.3x4.3x3.0mm $1275 Photographed in book - see other photo on this page. "I received the gemstones yesterday...absolutely gorgeous. I am so pleased.."